Duke Energy has filed a pair of integrated resource plans (IRP)with North Carolina regulators, sketching a 15-year resource plan that adds significant new solar resources but continues to lean heavily on natural gas-fired generation as the utility shuts down older coal plants. Between Duke Energy Progress and Duke Energy Consumers, the company will add 9,534 MW of gas capacity by 2033, starting next year. Duke will add 3,671 MW of solar capacity across the same timeline. Environmental advocates praised Duke for closing down coal facilities — some ahead of schedule — but Sierra Club said the plan "doesn’t go nearly far enough" to tackle climate change. The group said wind energy and efficiency could have allowed Duke to significantly reduce fuel costs and more quickly phase out older fossil fuel plants. Duke is working to reduce its carbon footprint and says it can have coal phased out by 2050, but green groups argue that's not a particularly rapid schedule, especially when the utility has options. "While it's good that Duke is starting to realize that investing in clean energy sources makes more sense than burning coal, this plan doesn’t go nearly far enough," Sierra Club campaign representative David Rogers said in a statement. Rogers accused the utility of "doubling down on fracked gas" and planning to burn coal for another generation, which he said "doesn't do anything to address the climate crisis." For Duke's part, the utility says it is working quickly to phase out dirtier coal plants, as well as add renewables and energy storage. "As we retire old coal, in most cases we will replace that with natural gas," Duke spokesman Randy Wheeless told Utility Dive in an email. "Going forward, Duke Energy’s new capacity additions will be renewables (solar, battery and pumped storage) and natural gas." 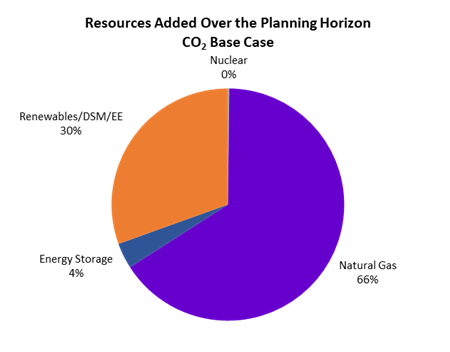 Looking out to 2033, the utility says 66% of new capacity will be gas, with solar, efficiency and demand side management making up 30%, and energy storage contributing 4%. Duke's IRP objectives include reducing carbon dioxide emissions by at least 40% from 2005 levels by 2030, with approximately 60% of electricity coming from carbon free clean energy sources. In regulatory testimony, Duke Energy Progress officials said customer growth, plant retirements, contract expirations and additional reserves will mean 6.3 GW of new resources are requited in the next 15 years. Duke Energy Carolinas will need just over 4 GW of new resources. While Sierra Club indicated it would have liked to see wind energy included in Duke's IRP, the utility has said prices in the Carolinas are not low enough yet. This summer, Duke announced it had abandoned a request for proposals to purchase 500 MW of wind energy for customers in North Carolina after the utility concluded proposals were "not attractive enough." But the utility is still looking to add more renewables. In July, Duke filed an RFP for 680 MW of large-scale solar and other renewables in North Carolina and South Carolina. Indiana 2018 IRP Stakeholder Engagement <Click to learn more about Duke Energy Indiana's Integrated Resource Plan (IRP) activities. We are currently awaiting for information on Duke Energy Indiana's next IRP Stakeholder meeting. The earliest date for the next IRP meeting is mid-October. Furthermore, Duke will be requesting an extension of the Nov 1, 2018, submission deadline of its report to the Indiana Utility Regulatory Commission (IURC).